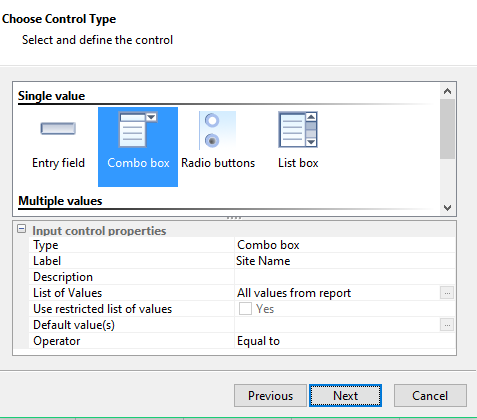 This article describes how to set up input controls and how they are used to filter within a report. 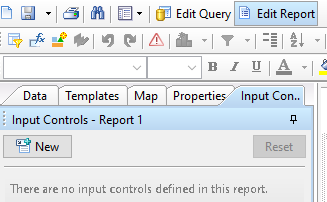 When in edit mode of a report, go to the Input Control tab on the left side of the report. 2. Click “New” to add an input control to your report. 5. Go to the List of Values: Would you like to display all values from the report or only a select few? If you would like to select a few, click the “…” icon. 6. 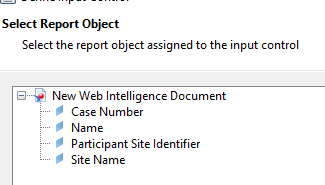 Decide if you would like a default value to be selected when a user opens the report. To change the default value, click on the “…” icon. 7. Choose the operator by clicking on the operator type. 8. Depending on the control type, there may be an option for the number of lines that are displayed at one time. To change this, click on the number of lines and use the arrows to increase or decrease the number. 9. Once the properties are filled out, click Next. 10. Choose what you would like the input controls to filter, whether it is the entire report, one tab of the report, or one table on the page. 11. Once this is selected, click Finish. 12. Your input control will appear and you can select you values you would like to filter by.